Serendipity. That’s the only way to explain it. 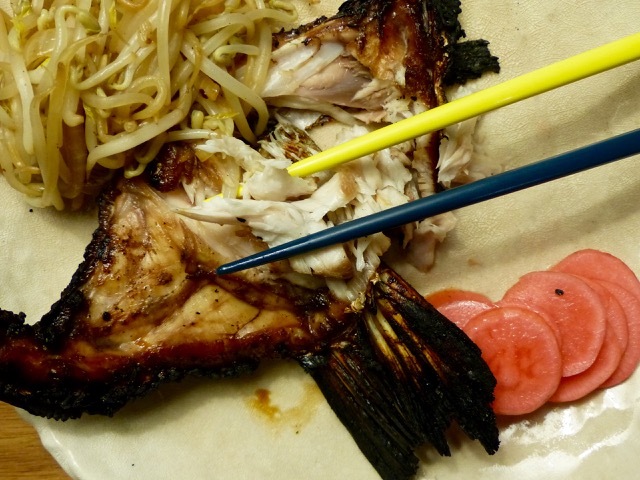 Last night we met a good friend for dinner and she happened to order some hamachi kama, or yellowtail tuna collar. The “collar” is quite literally the “neck” portion of a fish, or the section just behind the jaw. 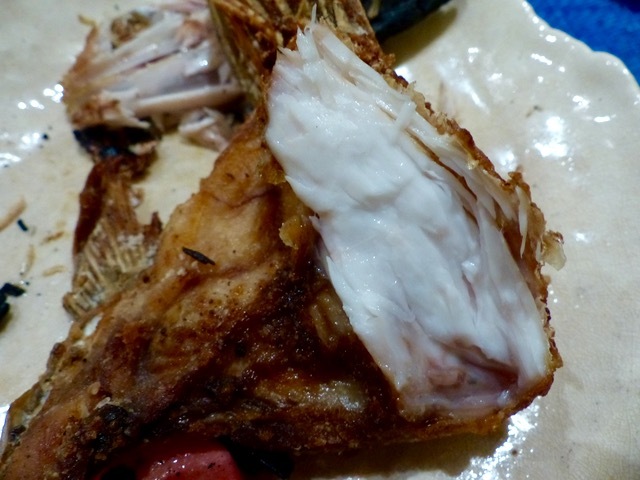 I am not sure if Filipinos differentiate between the fish jaw and the neck, but tuna panga or jaw is a delicacy that is enjoyed by many, particularly given the abundant supply of tuna landed in the south. Many would refer to these as trimmings (after processing or portioning a fish), but for foodies, this is possibly the best part of the fish! At any rate, I noticed a premium price on the hamachi kama at last night’s dinner, and wondered just where one might score some good collars. Then as if by divine intervention, we had breakfast with Mrs. MM’s cousin this morning, and she says, out of the blue, “could you use some barramundi collars?” Are you kidding me, is that lucky or what? Sea bass or apahap are delicious fish and I imagined the collars would be interesting to experiment with. These collars must come from bigger 3-4 kilo fish compared to the relatively small frozen sea bass that are farm raised and sold frozen from General Santos fish farms. So mid-afternoon, a package with 5 frozen barramundi collars was dropped off at our home and I promptly decided to cook them for dinner. Three collars were marinated for 30-40 minutes in a mixture of kikkoman, mirin, a touch of sugar and some salt and pepper. We then grilled these over charcoal and proceeded to singe or burn them just a bit too much. The fins were a bit inedible from the charring, but the meat was otherwise a phenomenal slam dunk. Each collar was surprisingly meaty and the texture of the fish was superb. Definitely a 9/10 experimental result — if we regulate the heat a bit better the next time this would easily rate a 10/10. A little dipping sauce of soy and kalamansi with side dishes of pickled radish and some sautéed bean sprouts and I was a happy camper. With the remaining two collars, we just seasoned them with salt and pepper and coated them with a mixture of flour and cornstarch and deep-fried them in lard (vegetable oil would work too). Sarap! I love fish collars. I really like the meat from the collar, the cheek, and the “forehead” of the fish. We frequent a sushi place here in the Bay Area (Nama Sushi) which also serves Tuna and Salmon “kama” in a bento box. 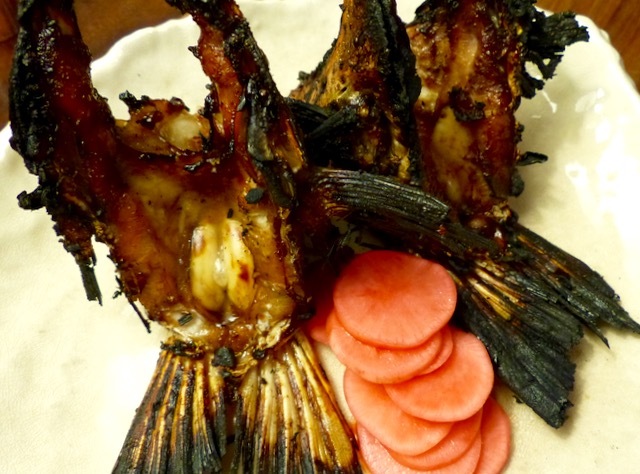 Large fish collars grilled to perfection, drizzled with some kind of thin teriyaki sauce. Also good to share with someone ordering some ramen. Also a family favorite, salmon belly (all the fat for much less than the price of salmon filets) sinigang. Just dump everything in the pot and simmer for a while. A hearty and healthy broth. Yum! Anyone chasing the rich flavour that soya sauce brings to a fish marinade but wants to avoid the inevitable dark effect can experiment with Japanese red or white miso. 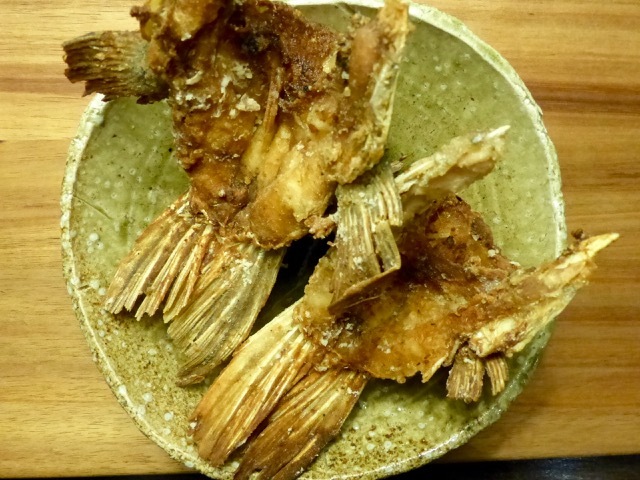 It goes together very well with the addition of finely grated ginger which also lessens some of the unwanted strong fish flavour that comes with certain types of fish. Thanks Millet, first time I heard of LSS and for one you can call an aficionado of, but mostly in opera. Mimi’s in la Boheme, Violetta in La Traviata, Werther in Werther, etc. MM: Zubupanga for the win! I will look for it in Zubudagat’s menu, heehee! 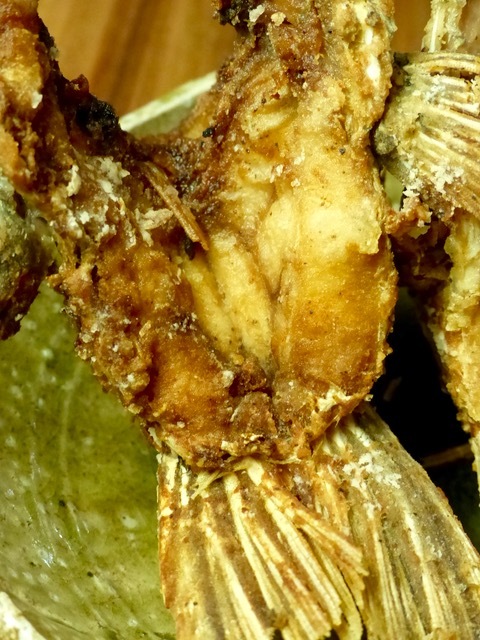 For hamachi kama you could try going to Cartimar, and it should be from 1,200 to around 1,600 per kg.. The problem with the jaw that you like is that there is a lot less meat on it than the collar, and at its price, it can get quite expensive. Cartimar is a hidden gem for Japanese items, aside from the cyanide caught marine fish that are sold for the live aquarium trade. By the way I don’t think Hamachi is from the tuna family. It’s actually a yellowtail amberjack. 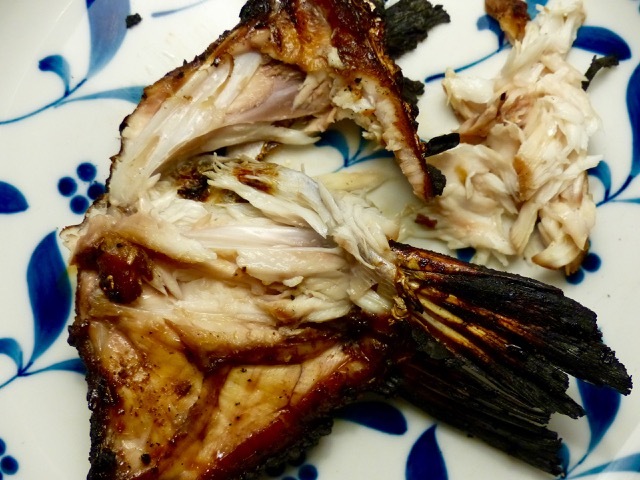 I believe it’s a farmed fish and the collars are really quite delicious when grilled. The main body flesh is used mostly for sashimi. Marketman’s Christmas Treat for U.S.-Based Readers!! !